If we mentioned taking your meeting to the sea, your first response would more than likely be “No way, that’s too expensive”. 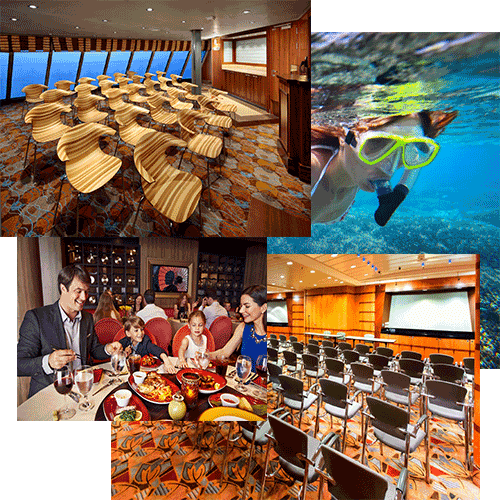 Did you know that programs aboard ships are normally 20% – 30% less than hotels? There are no added costs for meeting space nor audio visual. Your guests will be treated to a wonderful experience with extra amenities such as shore excursions that they can choose to purchase on their own or you may choose to have something provided by your company/organization. 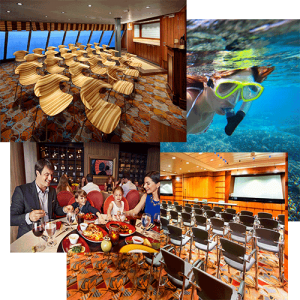 We have the ability to provide group discounts lowering your cost and we can utilize venues on the ship for social events as well. Contact us for more information – you could really be missing a wonderful opportunity to thank your staff, reward your team or do something fantastic and even raise attendance. Do you have a group of family or friends planning a trip together? There are discounts available for group bookings in addition to promotional opportunities. Spend a lot of time together or meet together when you want to. Take advantage of the numerous adventures or relax by the pool with a book. There are so many options. 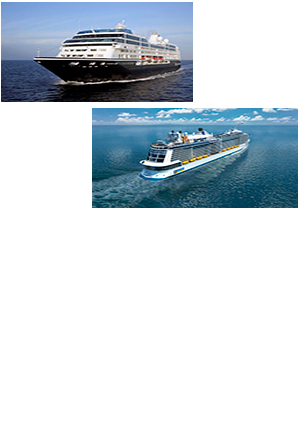 Each cruise line has many incentives and decisions to be made. We are here to help you through that process – why add that to your already busy plate. Call us today! Are you looking for that great vacation? Whether it’s your first or tenth cruise we know that you will be looking forward to getting away and enjoying the company of those with you. Let us help you make the process easier by giving you options, pricing and guidance every step of the way so you know exactly what to expect. Check out the links below and feel free to surf the sites to get an idea of what you can experience – and it will be the experience of a lifetime. Call us today! Begin Shopping Royal Caribbean for the Cruise Vacation of your dreams. Begin Shopping Celebrity Cruises For the vacation of your dreams.